Presidential races have had a history of being dirty and under the rug, and political cheap shots were never hard to find. But this year, in an already breakthrough election, candidates have thrown out more ads recently than ever before. Political standoffs between two parties or campaigns have usually resulted (or been the result) of an attack ad, complicating already very political situations by letting the general public have an unusually high say on the outcome. Thus, TV spots have turned into political weapons — with endings both beneficent and disastrous to their authors. Most recently, these political ads taken huge strides in the form of attacks back and forth from the two remaining candidates, Barack Obama and John McCain. Although Obama has just recently started sending out “attack” ads, mostly as responses to McCain’s harsh accusations. The first real sign of this was McCain’s “Celebrity” ad, which was the result of a non lethal (in the sense of attacks) but heated standoff between the two senators. The ad, sent out by a semingly fearless McCain squad, compared Obama to the star-struck Britney Spears and Paris Hilton, and was responded to in a surprising fashion — by Hilton herself. The response was brilliantly played out to both send a message to McCain, and — as another topic — improve Hilton’s public status. It worked, flooding out McCain’s original ad and setting the stage for Obama’s more political response, which delivered a more serious but at the same time up-beat message. 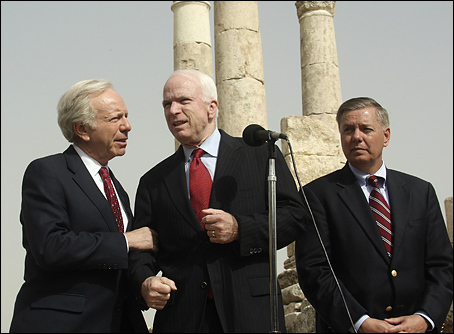 This was really the start of McCain’s continuous but mild public downpour, in which his previous political gaffes have come back to haunt him, including his Iraq-Pakistan border nightmare as well as his foreign policy mistake in Jordan, pictured, which occurred during a press confrence. Obama, though, has never capitalized on these public weaknesses. Taking a position many politicians in his would have quickly decided against, the senator will only fight once attacked. This way, not only has he kept a very clean slate, he has had time to asses the attacks aimed at him, quickly differ what he can say, and then release a public spot with many more directions and points to make than McCain. This, however, has never been referred to as “weak.” Obama’s team has carefully picked apart attacks (some of this is public) and assessed where they can attack and how they can cover up their softer political spots. A great example of this was Obama’s second major attack ad towards McCain, named “Fix the Economy“. The ad was placed a few days after the “celebrity” fiasco, and is applauded by myself as well as many political experts for its seemingly perfect timing. The spot aired during the dubbed “aftermath” of the war-like celebrity dispute, where the public was waiting for more moves from the two campaigns. Obama immediately recognized the situation and sent out what I like to call his “smoke grenade.” Geared towards a topic not mentioned around that time due to the previous Iraq-centered debates, Obama took footage of McCain claiming the American economy was in good shape and threw it against clips of American’s disagreeing with him intently. The ad was politically and factually sound down to the finest details, even including the states the Americans lived in, which were battleground swing-states for Obama and McCain (Indiana, Ohio, Kentucky ect.) that are currently up for grounds in a political perspective. I call the ad a “smoke grenade” because it both did tremendous damage and put a cloud of smoke in-between the conservatives and the general public. The points made in the ad sent the McCain party wheeling for a response, and the eerie gap of time made an effective bad aftertaste towards the republicans publicly. What I mean by this is since political attacks were plentiful up to that point for weeks, the world had prepared itself for a McCain attack. But in a sense, it never came. So who can we credit this to? In my opinion, it has really been the work of Obama’s campaign working together, headed by the smart PR decisions of Jim Messina, the Chief of Staff. So as McCain keeps pumping out attack ads (here is the newest and the response), Obama will keep bouncing them back in the same way he always does — sifting through the ad and hitting hard on the facts. And that’s why Obama is not only winning in the PR department as well as the television side — he’s dominating. 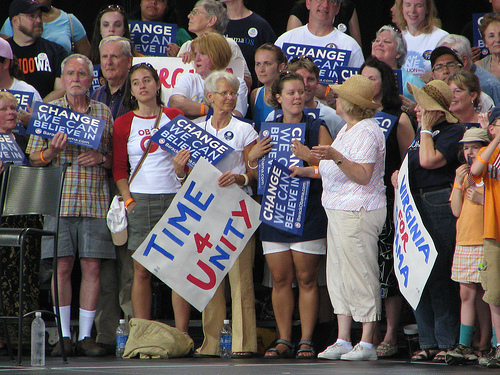 Genius marketing mixed in with perfect tactics and fan support have made senator Obama’s new ads as effective as ever. After McCain’s celebrity attack ads geared towards Paris Hilton and Britney Spears as well as the Illinois senator, a response ad was imminent — and hyped. And did it come, in Obama’s first attack ad: “Embrace”, which turned the tables on the popular political ‘celebrity’ topic and focused on the popular web video of McCain hugging current President George Bush — who has now become public enemy #1 for the Democrats. More notably though, “Embrace” was truly the first full-fledged attack on McCain, and in my opinion it came at the best time. Although he has been steadily gaining on Obama’s lead in the polls, McCain’s PR has been on the decline recently, starting with his Iraq-Pakistan border gaffe and continuing with his recent attack commercials that seem to have little thought and research thrown into them. And because of this they have been ripped to pieces publicly by Obama staff and then discussed in numerous liberal blogs and forums. On the flipside, Obama’s ads have been technically defensive responses with savvy quotes and researched facts, which have strangely been untouched by the right wing so far. His second ad, “Economy” was a simple but genius approach which has not been yet done before, but startled viewers. Starring McCain’s economic gaffs and disagreeing American citizens, on air the ad was very convincing — although it is very, very possible the people in the ad were the ones who agreed with Obama. But what not many people realize is that the Americans in the ad were from some of Obama’s weakest states, including Ohio, Indiana, and Kentucky — where the average Joe would probably a McCain guy. This may have gone unnoticed by many, but it was a great idea for the campaign to exploit that weakness in a public way. But not only is Obama winning in the advertising category, he’s orchestrating McCain attacks every day — most without him knowing. Obama’s fans have played a huge role in his campaign, and they have continued to on the web, where “first door on the left” type of blogs are sending out disses and attacks to the republican side with appeal to everything from McCain’s secret service to remixes of his gaffs and views being ridiculed by “experts”. So as Obama continues on with his hyped running mate decision and television ads, he knows one thing for sure — he won’t be alone. Far from it. It has occurred to be that gaming has been on more of a decline than ever. Growing up with a Playstation and a Playstation 2, I was in love with adventure games equipped with good storylines. I always thought that good video-games should be movies that you can control, where there is an 60 to 40 percentage of gameplay to in- game movie transitions between levels. I remembered buying games for my Playstation — I was like a kid in heaven. Surrounded by great titles that I knew would occupy and entertain me for years, I knew there we no bad choices for my platform. And with a master video gamer as a big brother, I got some fun gameplay in and great insight from him. But soon after the Playstation 2 came out, gaming got bigger and more important in pop culture and because of that, more time and money was put into it. This generated better graphics, but not much else. More and more games are now based off of bad Disney movies and younger celebrities like Miley Cyrus and Lizzie McGuire which sell but aren’t nearly of any quality. And because of this, more and more games with plots and original gameplay have vanished from the shelves, leaving true gaming purists saddened. But this is like losing a vote and gaining one hundred for a presidential candidate, he/she wouldn’t care. And they haven’t. So with the future not looking grim and the with the video game shelves flooding with worse and worse games, this is not a good sign. Of course there are a few games still around from this dying Breed, but the best games still remain in past platforms. And sadly, things will remain this way until changes are made. Now as the election narrows down, and with only two fighters left in this presidential melee, news today is merely two subjects — Obama’s trip and the so called “fact” the the press lean towards him. What is the truth? Well, to clarify this to myself, I wouldn’t call the press one. In fact, it is divided into five totally different sections: Newspapers, Magazines, Radio, TV, and Internet. Calling a one of these organizations liberal or conservative is hard to do, for example: although CNN may have 4 Obama articles to one McCain story, its staff’s blogging section may be overwhelmingly conservative. After the New Yorker controversy, a magazine that was thought to be liberal is now questioned, while in my mind they were just poking fun. On TV, reporters may belong to the conservative party, and have pro-McCain views, but report on stories about Obama’s trip to the middle east. On the web, (what I think is the most opinionated source) where the candidates control their own ground, nothing is held back. Both Obama and McCain have set up camp with they own websites, and grown outward, each trying to conquer Youtube, Myspace, and Facebook. Although some of this has lured in otherwise non-voters, this task is almost impossible — there are so many users on these web powerhouses, that having an Obama or McCain section of the site is not going to effect anything — people are still going to post whatever the heck they want. So although I do think there are some West Wing news sources and some conservative news sources, it is virtually impossible to enter that realm and come out with a credible point. Now with that said, I will get into what I think. This election has been like no other in terms of its candidates — with the first woman and first black president. Barriers have been broken, and the press has no doubt soaked it up. Hillary Clinton put this point very well many months ago when the Democrat side consisted of Obama, Clinton, and John Edwards. She pointed out that there are new candidates for America to ponder, herself as the first woman, Obama as the first african-american, and then — there’s John Edwards. Her point was that the dominant figures in America have been rich, white men and now that this is starting to change, the bold new political figure won’t exactly be bold and new anymore if it is a while male. And now with Obama against a white male, the public would love to know all about this different breed of politician that Obama is and the press has had a field day telling them all about it. Do I think this is right? No, I believe the person who deserves to lead the polls should have the right beliefs about America and not have the public be biased or have hatred against them by their race, gender or appearance. So the press might claim that they only write more about Obama because more people would like to know about him, but that isn’t exactly true. America is in a dead heat in this race, leading into the convention. The percentages have been almost been equal, currently CNN says (not that I fully believe them) that Obama is winning the national polls 47% to 41% for McCain. Looking at the US map, McCain has secured many states and has many states leaning on him compared to Obama, who (like the average Democratic powerhouse) secures less states, but has control of the more populated ones. So, since this is a perspective blog in many sorts, I will put my point across. What I believe is that some of the press is overwhelmingly left wing and some of the press is overwhelmingly conservative, but with so many news sources and perspectives to take in, it’s very hard to accuse anyone of being partisan and be correct. I do believe Obama can get more press than McCain because he has broken many boundaries, and that is part of the reason for this post to be written. But another part of that is the press being a little more left wing than conservative. It seems these days advertisers won’t stop at anything to get their product out there, but there is a point where enough is enough. Deodorant powerhouse Right Guard is now advertising on armpits, as shown around London, where they pay you to put a tiny TV on your armpit. Yes, you heard me right. They will patch a small TV (in that special place) to your jacket. Some people call it genius, some call it just wrong. There are two main flaws with this campaign that I can think of: first, unless free deodorant comes with the TV ad, people squinting to see may catch a bad smell… Second, how are people going to see the ad in the first place? It’s under someone’s arm, for Pete’s sake. What are you going to do, ask the guy to lift his arm up? Also, the armpit, as great as it is, is not exactly the first place you would look for an ad, even on a person. Although this is obviously messed up, and I can’t (at all) see how anyone is going to make any money, it may be just whack enough to work, but realistically on a small scale only.